WITH graduates rising to the top faster than ever before, many are starting their legwork early by securing internships in high school or university. But what makes a good intern and how can you maximise the learning outcomes of your industry experience? 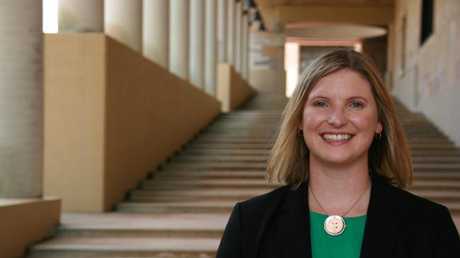 I asked Kirsty Mitchell, the director of Bond University's Career Development Centre for her top tips. "An internship is not always about getting a foothold into a job," she says. "It might segway into a job, but it might not and that's OK because it's actually about building relationships and transferable skills. "You want to be adding value and asking yourself: "Why am I interested in this?" Bond University student Peyton Hutchins, 17, discovered her passion for journalism in high school, and sought out an internship at the Gold Coast Bulletin when she was just 16. "I found the experience so beneficial because it helped me build skills and get (real world) insight into the industry," she said. "I think you have to be passionate about it too ... I took a week off school mid-year which was quite an important time, but I knew the opportunity to do work experience would be so valuable." Internships, work experience, there's so many different names that companies will use to advertise opportunities. Some students, particularly university students, will secure an internship through an informal interview which is an opportunity for you to ask questions about how this person got to where they are, and show some real interest. LinkedIn is also a great tool: never has it been to transparent to know who the CEO or CFO of a certain company is. IT'S important to set out your expectations early and ask: what are the tasks, time frames and realistic deliverables that I can achieve here? Being a student is your primary job so don't overcommit, but do have a plan to work through so that you know you're contributing. Try shadowing people in different areas of the business other than your own and don't be afraid to ask questions. Some people think 'well im not getting paid to do this' so they'll turn up late or dress casually ... the reality is that you're not going to be curing cancer on day one, you have to know the chords before you play chopsticks. Make sure you dress up on your first day - not in a ball gown - but if the dress code is smart, go one step above that. Treat it like a job interview. You should also be welcoming and friendly and remember names. Some people say 'oh I'm rubbish at remembering names' and that's just a huge cop out. You will get to know people in the office if you A) know their name and B) ask them interesting questions. And nothing builds a relationship quicker than bringing in a packet of cupcakes to share.